On a street that features obsessive-compulsive vampires, a blue monster with serious food dependency issues, and a wooly mammoth that may or may not be imaginary, Big Bird sort of makes sense. I mean yes, he’s an eight-foot-tall bird with the mind of a six-year-old, but if you have a good heart, people are usually pretty willing to overlook something like that. It turns out Big Bird isn’t just a ridiculously tall canary-like being; he’s also the product of a loving gay couple who meticulously put him together. 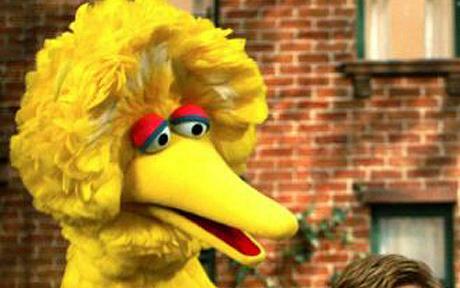 That’s right: Big Bird, that integral focal point of many a childhood, has two daddies. And look how well he turned out! “He said, ‘Would you like to come to New York for a few days?’” Lyall says. “I said, ‘I only have a few days.’” Soon after, Lyall moved stateside. Their match proved all the more perfect as they made Big Bird. Love began in a wondrous whirl, fashioning a kind of prototype. “Patched together with bits and pieces,” Lyall says. So basically, one of the most beloved and recognizable stars on television, and he’s from a gay family. Awwww, ain’t it sweet? I mean, yeah, he’s made out of fabric and dyed turkey feathers, but still, let’s not nitpick here.